Again, dude is wearing a jet pack. Photo via Getty Images. 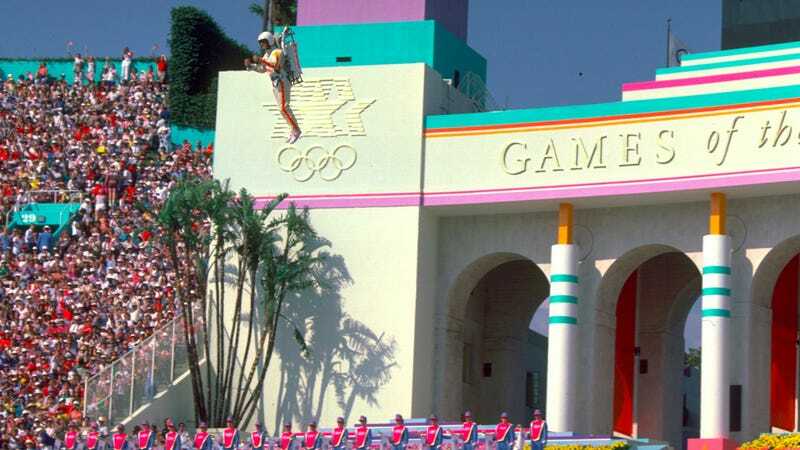 Perhaps you already knew this, but just in case you didn’t, it feels important to note that the Opening Ceremony of the 1984 Summer Olympics, which took place in L.A., featured a dude zipping around the candy-colored auditorium in a jet pack. Hell yeah, baby—the future! It wasn’t just the dude in the jet pack. In a 2011 look back, the L.A. Times recapped the ceremony in all its apparently wacky 80s glory. The 1984 Summer Olympics were kicked off by what many still consider the greatest opening ceremony in Olympics history. Where else will you ever see 84 pianists playing “Rhapsody in Blue,” a guy flying with a jet pack, Rafer Johnson lighting the Olympic torch, President Reagan, Sam the Eagle and a standing ovation for Romania, the only Communist-bloc country to attend the Games? Plus, John Williams’ “Olympic Fanfare and Theme.” But yeah, dude with a jet pack. This fellow’s name was Bill Suitor, and he worked as a test pilot on the jet pack project for Bell Aerosystems. CNN talked to him about his experiences in 2007. It sounds frankly miraculous he managed to stick the landing. “One of the hardest part is mastering the navigation. People driving in a car on a flat surface often have a tough enough time. Imagine adding to that more degrees of mobility then trying to control that in rush hour traffic maneuvering around other people with personal jetpacks,” said Paul Saffo. And that is why it’s 2016 and you don’t have a jet pack. Because if you did, it would be impossible to maneuver and you’d do nothing but complain. Sure looks great in the file photos, though!